If a lifetime can be judged by helping others, then George McNeillage has lived several lifetimes’ worth. 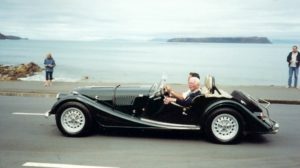 And at his memorial service last week (20 July 2010), his family remarked on the sheer permanence of the man, both as a father and grandfather, but also as one of Plimmerton’s favourite sons. Over 100 Plimmerton residents, Porirua City councillors and employees, and staff from the Harbour View Rest Home, joined family at the Plimmerton Pavilion, the building George specifically asked his service be held in. George McNeillage was born in Paisley, Scotland, in 1918, third of five children. In 1932, George left school, aged 14, and secured an apprenticeship in building when he was 16. George connected strongly with the underdog at a time when poverty and hardship was widespread, a philosophy he would embrace all his life. His leanings turned to socialism in the lead up to World War II, and he registered as a conscientious objector when he was called up. Granted exemption, he worked with the Quakers in London to assist with charitable works, and this continued after the war with the Friends Relief Service, helping with relief efforts in Poland and Holland. He became engaged to his wife Hetty, a Quaker, during this time, and were married in 1947. George was asked by the Quakers to help supervise building works at Adams College in South Africa, a college with an excellent reputation for higher education for black Africans. But within a decade the college was falling foul of Apartheid policy, so George, Hetty, and their two children, decided to settle in New Zealand, where Hetty’s brother lived. Within two hours of stepping off the boat at Wellington in 1957, the family were whisked up to Cluny Rd. George worked as a builder during the week and worked on his Motuhara Rd house in the weekends. George’s son Dermot can remember saying goodnight to his father every night, who would look up from his drawing board in the evenings. He initially got a job at Hutt County Council, which Plimmerton was part of at that time, but travel to the Hutt was difficult. He changed jobs to the Porirua City Council, an exciting move as the city was starting the development of its new city centre. George eventually became the chief building inspector for Porirua City, and erstwhile town planner in a time when none existed. But it is particularly as a member of the Plimmerton Residents Association, which he joined in 1959, that his passion and commitment for his community is remembered for. An early story recalls the ‘night soil’ worker, who convinced Plimmerton residents to pay him six months in advance before absconding with their money. George convinced a Member of Parliament to visit Plimmerton, telling him horror stories of locals forced to dig long-drops or throw their waste into the sea. The MP rallied and organised the money to push a sewage scheme for Plimmerton. It was one example of the battles George pursued in his fearless belief of what was right and proper, and defending disadvantaged people. He seemed to be a man who could literally do anything, and when his passionate defence didn’t win the day, he was almost perplexed with disappointment. Friends can recall his petition against encroachment fees for Plimmerton driveways across council land, and being deeply disappointed at his submission not carrying the day at council. He also had a long battle with the regional council over pensioner housing, eventually describing the council as “a burden, inefficient, and an empire-builder”. But he had his victories; his legacy of fighting for the underdog is particularly notable in co-authoring the New Zealand Standard 4121 in 1985, the standard for disabled access, with wheel-chair bound educator Alexia Pickering. She, and the rest of the disability sector, remembers him for his intensity, compassion – and great technical ability. Although George was chair of the Plimmerton Residents’ Association within one year of joining, he is best remembered for his long service as treasurer and being on the management committee for the Plimmerton Pavilion from 1967 to 1999. The pavilion was unquestionably his baby, and he oversaw many extensions and improvements. His great lament was trying to convince the Hutt County Council to share his passion for the building, but when Plimmerton came under Porirua, his building inspector colleague Don Fenton said it was like his birthday had come. However, Don had the temerity to ask George if he saw a conflict of interest with his role as chief building inspector. George’s eyes flashed; he told Don if he didn’t have anything better to do, there was some filing to get on with. Porirua mayor Jenny Brash, herself a Plimmerton resident, recalls the first time she visited George’s home, and thought to herself the magnificent house could only have been built by a building inspector. It was Hetty’s habit, when George had visitors, to stamp on the floor in the middle of the lounge, so George would come up from whatever he was doing in the garage. Ms Brash particularly remembers handing over her mayoral duties to George on January 1, 2000, just for Plimmerton. George had thrown himself into the millennium celebrations for Plimmerton, which included wearing the Mayor’s ceremonial chains for the day. See photo above. In his time at the Harbour View Retirement Home, George admitted to his family that Altzemiers was a big challenge, but still thrived with energy, giving the staff cheek, enjoying sports on TV, and engaging in political discussion with visiting friends and family. And it is unlikely that George will have a issue with St Peter at the gates of heaven, or even have to line up. As Don Fenton puts it, “people like him, get in the side door”. 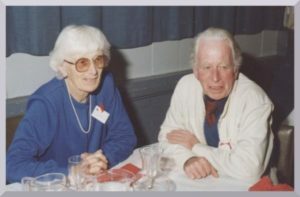 George and Hettie McNeillage at the Red Cross 50th Jubilee, Plimmerton Pavilion, 1989.